Dharamsala, HP, India – Invited by the Bhaktivedanta Institute, a centre for advanced studies in science and Vedanta associated with the International Society for Krishna Consciousness, His Holiness the Dalai Lama attended the inaugural session of a conference on Science, Spirituality & World Peace today. The event took place in the auditorium of the Government Degree College, Dharamsala. His Holiness was welcomed to the stage and presented with a bouquet. All stood for the National Anthem. After a song of praise to Lord Krishna, the principal guests gathered to light the peace lamp. The Chairman for the occasion, Dr Sudipto Ghosh gave a welcome address, concluding with a quotation from His Holiness, “If you want others to be happy, practise compassion; if you want to be happy yourself, practise compassion”. In a subsequent address elaborating on the theme of the conference, Dr PB Sharma remarked that truth, the cardinal principle of religion, is also a principle of science. A message from Subhag Swami stressed the need to create a culture of peace and harmony. “Brothers and sisters, I’m extremely happy to participate in this meeting. Among this gathering of brothers and sisters, some of us, like me, belong to the 20th century. Others who are not more than twenty years old belong to the new generation of the 21st century. “The 20th century has gone, but if we look back it was an era of war and violence as a result of short-sightedness, giving in to destructive emotions, a lack of moral principles, as well as a lack of concern for others’ well-being. This was compounded by a belief in the use of force to solve problems. These factors still prevail to some extent at the beginning of the 21st century. The news is filled with stories of killing. Corruption flourishes. Poor people suffer. And in many places religion is used as an excuse for violence, while scientific developments have provided more efficient ways to kill. His Holiness reported that scientists cite evidence that basic human nature is compassionate. This is borne out by our common experience of being cared for by our mothers. Without that care we would die. Common sense also tells us that if one of our neighbours is friendly and smiling when we meet, but another frowns with anger and hostility, we feel more comfortable with the one who smiles. If it is motivated by anger, science is likely to be destructive. His Holiness observed that we have marvellous brains—how sad it would be if we only use them to find ways to kill each other. He suggested that all 7 billion human beings alive today have the potential to develop compassion and can be guided to do so by adopting universal values that he likes to call secular ethics. He clarified that he uses the word secular in an Indian context of unbiased respect for all religions. He noted that so far science has learned a great deal about the material world, but is now gradually beginning to explore the mind and human consciousness. He predicted that during this century science will learn much more about our inner world. His Holiness recalled nuclear scientist Raja Ramana’s telling him that quantum physics’ new observations that phenomena do not exist objectively had been anticipated long ago in Nagarjuna’s writings. He asserted that ancient Indian understanding of the workings of the mind and emotions also remains relevant today. “We can change our minds. We don’t have to give in to anger and hatred. Since compassion and anger cannot co-exist, the more we cultivate compassion the more our anger will be reduced. Other animals seem to have a capacity for some sense of compassion, but they lack the intelligence we human beings possess to cultivate and develop it. “Compassion brings peace of mind and if we have that we won’t be deflected when negative events occur. A Christian monk I met in Montserrat, Spain, spent five years as a hermit in the mountains living only bread and tea. I asked him what he practised and he told me he meditated on love. And as he said that I could see from the sparkle in his eyes that he experienced the real, deep and lasting happiness of peace of mind. Challenged to say how an individual can really help others he agreed that it can sometimes seem as if one person will not be very effective. However, he stressed that change in the world always begins with an individual who shares what he or she has learned and passes it on to others. He reiterated that human beings are intelligent. We are able to understand that compassion is a realistic state of mind, whereas anger is not. We can also understand and observe that anger destroys our own peace of mind as well as good family relations. Anger attracts no friends. A student from Lower TCV asked about the role of suffering in our lives and His Holiness told him that it depends on your perspective. If you only focus on the hardship you undergo it’s tough, but if you can adopt a broader perspective it’s possible to recognise advantage and benefit even in great loss. After seeking his host’s permission, His Holiness spoke briefly to the Tibetan students in the audience in their mother-tongue. He touched on the efforts Tibet’s kings made in the 7th and 8th centuries to develop Tibetan culture. Consequently, the Tibetan language is now the most accurate medium for expressing the essence of the Nalanda Tradition—something to be proud of. He said that after 60 years of hardship, Tibetans have kept up their spirit and determination. Consequently, even Chinese hardliners need to question the effects of their policies. 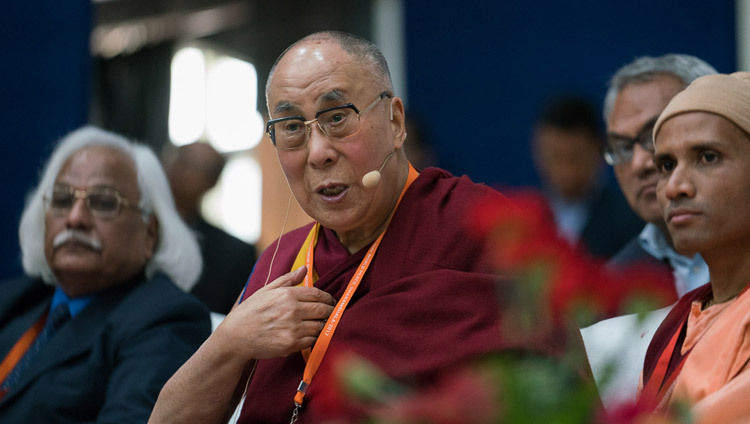 In his final words to the whole audience His Holiness noted that historically Tibetans have regarded Indians as their Gurus and themselves as the chelas or students. However, while the Gurus’ ancient knowledge has fallen into neglect, the chelas have kept it alive and so proved themselves reliable. He ended by repeating his sense of commitment to encourage Indians to revive their ancient heritage.